So you want to grow your own peanuts? That is possible! 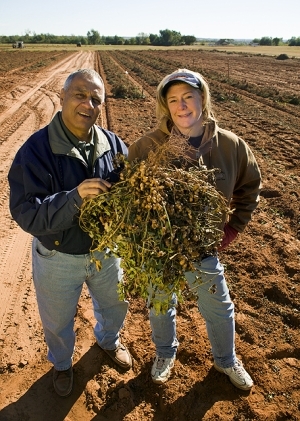 Since you now know everything about the peanut itself, the different kinds of peanuts, how the peanut grows and how the peanut plant develops it is time to get your hands dirty and get some real hands on experience with peanuts! In this article we will guide you step by step on how to grow your very own peanuts using everyday materials. In order to grow your peanuts there a few things that are absolutely necessary to succeed. If you can tick off every item in the list below you are ready to move on to step 1. -	Raw peanuts: you need raw, un-roasted peanuts. If you put a roasted peanut in the ground nothing will happen at all. You can buy raw peanuts at various places such as your local grocery store or supermarket. You can ask to buy raw green peanuts and the store clerk will probably know what you mean. Make sure that the shells are still around the green peanuts and that the skin is intact. Although all peanut seeds look the same, they all grow a different plant. In the article about the different types of peanuts we have already discussed what different kinds of peanuts exist, where they are grown and what their specific purpose is. When you just want to grow yourself a little peanut plant as an experiment you can go to your local grocery store and buy raw green peanuts. Remember that your peanuts need to be raw (un-roasted) otherwise nothing will happen and you are basically wasting your time. Also remember that it is best for the peanut to have a shell around it to prevent it from drying out. If the peanut does not have a shell around it at least make sure that the reddish skin is still intact. Use the potting soil to fill up the flower pot or container to about 2/3. The size of the flower pot does not really matter that much but recommended is a flower pot that is around 4 to 5 inches deep. The potting soil must be moist. You can add water using a watering can or a water spray. You can skip this step if you live in a warm area with a tropical or subtropical climate. Start with taking the shells off of four peanuts and place them on top of the soil, do NOT remove the reddish skin around the peanuts. You can also decide to plant the peanuts with their shell, this will however make it harder for the peanut to sprout since it now has to go through the hard shell. 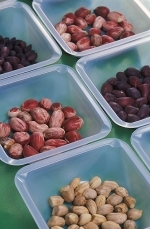 Make sure that you leave enough space between the individual nuts so they can grow freely. Press the nuts into the soil and cover them with about 1 inch of moist soil. Now it is time for the peanuts to go outside. First you want to find a good sunny spot for the peanut plant to further develop, peanut plants require a lot of sunlight so try to find a spot where there is sun every time of the day. The type of soil is also important, make sure that the soil is not too dense, otherwise the pegs cannot penetrate the ground. You can loosen up the ground a bit with a rake. If the soil consists of clay try to remove most of it and fill it up with potting soil mixed with a bit of sand. First dig a hole in the ground, then proceed to fill the bottom of the hole up with a bit of potting soil. Plant the raw peanut seeds about 6 inches deep. Try to move the entire content of the container into the ground, make sure not to expose the roots of the small peanut plant since these are really delicate. Even though your peanut plant is not that developed yet it will further develop and it will need a lot of space for its roots. Fill the rest of the hole with potting soil mixed with a bit of sand. If you have more than one container of peanut plants we advise you plant the peanut plants about 10 inches apart from each other. After you moved your peanut plant to your garden water it using a watering can or water spray. Do not soak the soil, just make it moist. Wait with this step if the weather conditions are not right. The absolute minimum temperature for peanuts to grow outside is about 15 degrees Celsius (about 60 degrees Fahrenheit). Peanuts are also really sensitive to frost, we advise to wait a minimum of one week after frost to plant your peanut plant in the ground. Make sure to water your peanut plant on a regular basis, the plants require about one inch of water every week. Do not pour an entire bucket of water on your plant on Monday but distribute the amount of water over the week so that the peanut plant gets about the same amount of water every day. When your peanut plant has a reached a height of 6 inches you need to loosen up the soil around the peanut plant a bit, this way you are helping the peanut plant with its mission to get the pegs into the ground. You can do this by carefully digging with a small spade around the plant. Be careful though, we do not want to hurt the stems with the peanut embryos on it (pegs). Do NOT use fertilizers with significant amounts of nitrogen in it. 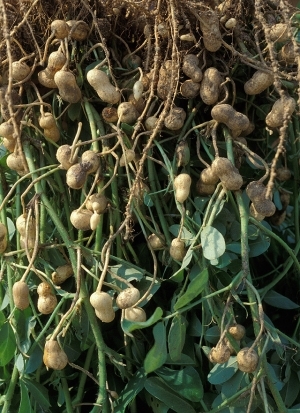 Peanut plants are capable of producing their own nitrogen, if you add more the plant will not produce a good amount of peanuts. You need to harvest your peanuts before frost starts, this is really important since peanuts are really vulnerable when it comes to icy weather conditions. The plant will give you a sign when its fruits are ready to be harvested, its leaves will turn slightly yellow. Another way you can see whether your peanuts are ready to be harvested is to occasionally digging up a few nuts and look inside the shells: the inner shell should have gold-marked veins. Use a spading fork to dig the entire peanut plant up. Make sure to stick your spade deep enough, this way you do not only lift up the visible part of the plant but also the most important part: the peanuts underneath the ground. Carefully shake most of the soil off. If everything went according to plan you are now looking at around 20 to 50 peanuts at the bottom of the plant! Take the peanut plant inside and hang it upside down at a dry and warm location for about a month until the leaves of the plant become crumbly. You can leave the peanuts on the plant. After about a month you are ready to do what you want with your peanuts. You now have perfect home-grown peanuts! You can eat them in various ways. It is possible to eat them raw, roast them or even bake them. If you want to roast them it is recommended to use an oven, put it on 350 degrees Fahrenheit (180 degrees Celsius) for about 20 minutes and voila: you have your very own roasted peanuts! Enjoy!